We pack bicycles with varying degrees of thoroughness depending on whether we will be able to leave materials at the destination airport. The principles are always the same, and the one thing we never do unless we have to is to put bikes in cardboard boxes. 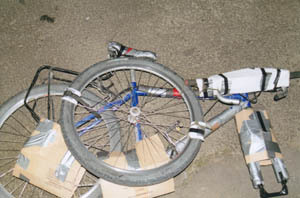 It is often said with much plausibility that boxed bikes may be handled without respect for their fragility and may end up at the bottom of a pile of heavy luggage. Unboxed bikes are unmistakably fragile and are too awkwardly shaped to pile much on top of them. The attached photos illustrate a fairly maximalist approach. The pipe lagging is optional, and it would be possible to get by with less cardboard. On some tours you will have to carry any packing materials with you. Fork spacers and a little tape dont weigh much. Cardboard boxes can usually be picked up from airport shops. At the beginning. Check your airlines policy on bikes before booking tickets. Obviously there is a risk that small planes just wont carry them. A few airlines charge, which is not unreasonable. We have never had any problems, but we still make sure. A week before travelling. Make sure that movable parts have not rusted in place (seat pin, pedals, handlebars). If they have become stuck you may need to take your bike in to a bikeshop. Obtain any packing materials needed. Fork spacers are usually free for asking in bike shops (they are used when bikes are transported before sale). You will probably be carrying a lot of panniers while you are limited to a small number of baggage items. By putting several panniers in a lightweight holdall you conform to the allowance and make carrying easier. Engage bottom gear and remove the pedals. These will be carried in your hand luggage, at least on the outward journey, for fear your bags get lost. Also remove loose vulnerable items such as bells and cycle computers (but bottle cages can stay where they are). Drop the handlebars so that the brake levers are at the bottom. 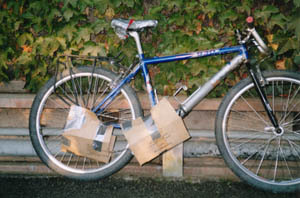 Wrap cardboard round the derailleurs (the most vulnerable area) and round the cranks and chain rings. It is well worth protecting the saddle. We use thick polythene which has now accrued several layers of packing tape. At this stage the bike should look as shown in the first photo. The next step is to remove the front wheel and to turn round the handlebars to make the bike flat. If you have a front mudguard or pannier rack you will have to loosen the handlebars at the stem so that they can be turned round against the fork (and then tighten them again). Otherwise handlebars and fork can move together. Place the fork spacer between the forks and tape it firmly into position. This is very important, particularly if you have had to loosen the handlebars to turn them, because the forks can easily be damaged by being squeezed together. Add pipe lagging to the forks and cardboard to the brake mechanism if you are being thorough. The result is shown in the second photo. Remove the skewer from the front wheel  this too will go in the hand luggage. Attach the wheel firmly to the bike as shown. It is important that it should be fixed to the right-hand side of the bike so that it provides more protection for the transmission mechanism. 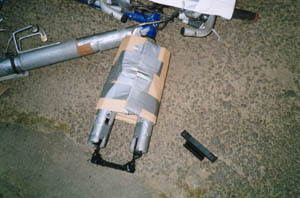 The attachment is at three points: seat stays using a toeclip; down tube using a toeclip; and to the handlebars, top tube and down tube together using a bungee which has the additional function of holding the handlebars flat against the frame. The bike is now ready to fly. Checking in. Bicycles are not usually weighed but you may be asked how heavy they are. Some airlines such as BA ask you to put the bike in a bag. Suitable poly bags can be obtained cheaply from the CTC shop as item CT224. Most airlines require you to deflate your tyres owing to a childish superstition that bicycle tyres may explode at low pressure and damage an aircraft fuselage. Some baggage handlers carry this belief to the lengths of imagining that a single air molecule left in a tyre poses a threat. You will have to humour them, but a deflated tyre runs a risk of puncturing. Fortunately BA now have a policy of not requiring tyres to be deflated, and we have been pleased to see that checkin staff adhere to it.